Site fencing, high visibility, used to mark and protect areas of work and to restrict access to equipment or installations. 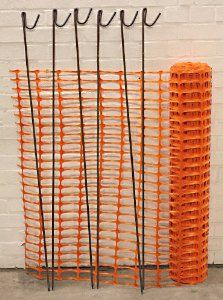 Safety barrier fencing is recommended to protect work sites, such as latrine pits, pipeline trenches etc. It is also used to put a barrier around installations such as water tanks, water treatment operations, pumps and well heads. Operators are better able to keep people away from the equipment where a work area is marked.